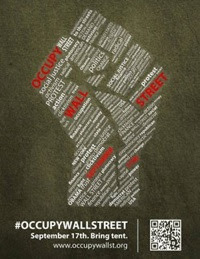 #OCCUPYWALLSTREET was inspired by the people's assemblies of Spain and floated as a concept by a double-page poster in the 97th issue of Adbusters magazine, but it was spearheaded, orchestrated and accomplished by independent activists. It all started when Adbusters asked its network of culture jammers to flood into lower Manhattan, set up tents, kitchens and peaceful barricades and occupy Wall Street for a few months. The idea caught on immediately on social networks and unaffiliated activists seized the meme and built an open-source organising site. A few days later, a general assembly was held in New York City and 150 people showed up. These activists became the core organisers of the occupation. The mystique of Anonymous pushed the meme into the mainstream media. Their video communique endorsing the action garnered 100,000 views and a warning from the Department of Homeland Security addressed to the nation's bankers. When, in August, the indignados of Spain sent word that they would be holding a solidarity event in Madrid's financial district, activists in Milan, Valencia, London, Lisbon, Athens, San Francisco, Madison, Amsterdam, Los Angeles, Israel and beyond vowed to do the same. "CEOs, the biggest corporations, and the wealthy are taking too much from our country and I think it's time for us to take back," said one activistwho joined the protests last Saturday. Jason Ahmadi, who travelled in from Oakland, California explained that "a lot of us feel there is a large crisis in our economy and a lot of it is caused by the folks who do business here". Bill Steyerd, a Vietnam veteran from Queens, said "it's a worthy cause because people on Wall Street are blood-sucking warmongers".